Nakhane Toure . Bongile Mantsai. Niza Jay. Thobani Mseleni. Gabriel Mini. Drama. Recommended. Coming of Age. Gay Interest. Music. Every year, the Xhosa tribe's young men are brought to the mountains of the Eastern Cape, South Africa to participate in an ancient coming-of-age ritual. 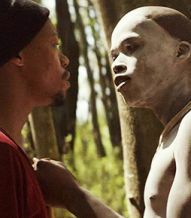 Xolani, a quiet and sensitive factory worker (played by musician Nakhane Touré), is assigned to guide Kwanda, a city boy from Johannesburg sent by his father to be toughened up, through this rite of passage into manhood. As Kwanda defiantly negotiates his queer identity within this masculine environment, he quickly recognises the nature of Xolani's relationship with fellow guide Vija. The three men commence a dangerous dance with each other and their own desires and, soon, the threat of exposure elevates the tension to breaking point.